HomeBlogInsulation: Learning The BasicsWhat is R-Value? Why Is It Important? What is R-Value? Why Is It Important? R-value is typically used to measure the effectiveness of your insulation. Simply put, this means the amount of air that goes in and out of your building. As is obvious, the higher the R-value, the greater your air barrier. Heat resistance is a major consideration in maintaining comfortable temperatures in your residential or commercial building. Less air loss and air infiltration means fewer cold spots and temperature fluctuations, and consequently, lower energy bills. Open cell foam is typically R-3.5 to R-4.0 per inch as opposed to R-6.0 to R-6.5 (aged) for closed-cell foam. Closed-cell insulation is denser and has a higher R-value than open cell foam. However, don’t write off open spray foam so easily; the closed-cell variety needs more material and is therefore more expensive. When done right, open cell spray foam insulation can provide you with many benefits (including cost savings) in above ground applications. It also offers a greater sound absorption than the closed-cell foam which performs better in below grade and exterior applications as well as roof cavities. What we are reiterating here is that spray foam selection is specific to building application and local codes. R-values of open and closed-cell spray foam also change over time. The building envelope experts at Platinum Spray Foam can help you make the right investment. R-value is one of the most important factors that influences the energy-efficiency of your home. 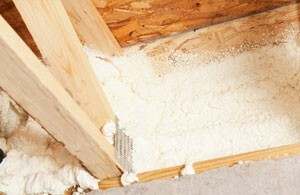 The effectiveness of an insulation also depends on how and where the insulation is installed. The R-value of a wall or ceiling, for instance, is different from that of the insulation itself, since heat flows more readily through studs, joists, and other building materials. Hence, the type you use and how much of it is applied will affect your building envelope performance, energy-efficiency and comfort levels. You can count on the trained professionals at Platinum Spray Foam to offer you the right solutions. Seamless installations eliminate any performance and safety issues. Consult us about your upcoming construction or retrofit project. To learn more about the R-value of open or closed cell insulation, call Platinum Spray Foam at (416) 731-8600 or request an estimate online.